Piercings are an increasingly popular way for individuals to differentiate themselves from one another. What started as a religious or group affiliated trend has transformed into piercing of tongues, noses and even surface skin. Tongue piercings first became popular in the 1980’s when the availability of high quality, surgical steeltongue rings and other types of body jewelry were readily available for the first time. The tongue piercing is largely associated with the Gauntlet which was the first professional piercing studio in the United States and from which many extreme piercings emerged. Jim Ward, found of the Gauntlet was known for promoting this piercing throughout his career. When a tongue is pierced, it is done so with straight barbell style jewelry, rather than a ring. 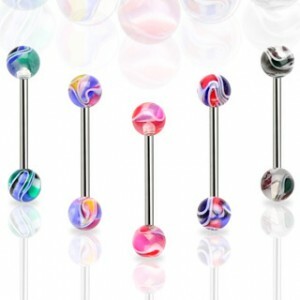 However, the term tongue ring has, over time, become the slang term used by many to describe the piercing. As the popularity of tongue piercings has grown, so has the variety of tongue rings available for individuals with such piercings. Originally only metal balls, the decorative ends of tongue rings have evolved into everything from acrylic balls to soft plastic designs. As a way to accommodate corporate Americans with a liking for this body jewelry, manufacturers have developed clear, flat and “no show” tongue rings. Others can enjoy neon, metal, glowing and shaped beads and balls. Proper placement of tongue rings and proper care is essential to avoid infections and even damage to an individual’s gums and teeth. The traditional and proper placement of a tongue ring is in the center of the tongue, near the center of the mouth. The tongue ring should be angled to slightly lean back from the teeth to make talking and eating easier. Although there are concerns about teeth damage, this can be avoided when the tongue piercing is carefully done and properly cleaned. Other than a slight impact on the way a person talks for the first few days, there is only a very slight chance of any teeth, gum or tissue damage due to a tongue ring. Piercings are good, temporary way for individuals to express themselves in a world in which places more and more value on being an individual and not a “follower”. With proper care and research, a tongue piercing can be a way for an individual to accomplish this.